SanDisk has just announced the highest capacity memory card for smartphones and tablets at MWC 2014. 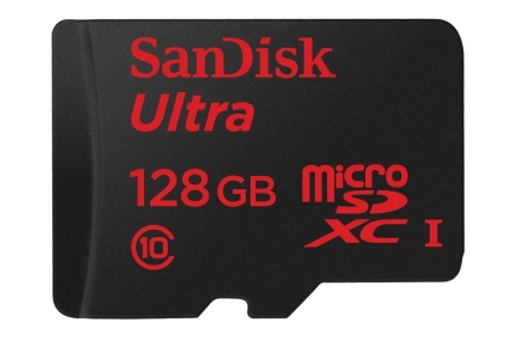 The SanDisk Ultra 128GB microSDXC memory card is the world’s largest capacity memory card for mobile devices. The SanDisk Ultra 128GB microSDXC memory card is of the class 10 categpory. It offers 30MB/s read speed and is compatible with microSDHC and microSDXC supporting host devices. SanDisk has also come up with a SanDisk Memory Zone App which lets you easily view, access and backup all your data from the memory card. There’s also a new feature dubbed OptiMem which takes care when you are low on internal memory and automatically transfers your photos and videos to the memory card. Interestingly, the first 128MB memory card was launched in 2004 and in just 10 years, technology has come so far that we are witnessing a 128GB memory card. While not many smartphones support microSD expansion upto 128GBs but we can expect them to start supporting them after the SanDisk Ultra 128GB microSDXC card hits the market.